Zambia's profitable copper mining industry is making its citizens poor, an explosive new report by a southern African research organization says. 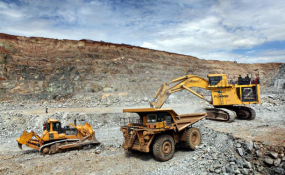 The report by Southern Africa Resource Watch examined conditions in the community around one mine in northwestern Zambia, where they say they found the vast wealth is not being spread to the surrounding community. And this situation, they say, is a tale told across mineral-rich communities in Africa. Report author Edward Lange said the organization chose to investigate that mine because the Canadian owner, which is Zambia's highest corporate taxpayer, has a good reputation. "But then, what we discovered, was that the wealth that Kansanshi Mine extracts does not match the poverty, the disorder, the poor social conditions which is prevailing in the shantytown of Solwezi," he said. "It is a provincial capital of the northwestern province of Zambia, but it could be termed to be a shantytown. ...They've polluted, they've displaced people in the community, facilities they've provided cannot quench the amount of pollution they've caused on the community." VOA sought comment from First Quantum Minerals, but it did not reply. On its website, the company said it had found that the operations "contribute almost 4 percent of the total economic value added to the countries in which we operate." Measured purely by its underground wealth, copper- and gold-rich Zambia should be one of the world's richest nations. In 2018 it exported more than $700 million worth of copper, which accounted for most of Africa's copper exports. Lange spoke to VOA from the sidelines of Africa's main mining conference, held this week in Cape Town. But Lange was not attending the Mining Indaba, the high-powered annual gathering of Africa's industry chiefs and investors. He spoke from the Alternative Mining Indaba, a grass roots meeting of mining-affected communities, faith-based organizations and rights groups. "This is a sad African story of a big investment where the communities are not benefiting," he said. "It's a failure, you know, the failure to use the abundant mineral resources to transform the lives of the people is what is worrying us. And this is at the center of discussions across the continent." But the nation's mining minister, Richard Musukwa, painted a rosier picture. He spoke from the sidelines of the Mining Indaba. "The effect of the mining industry on Zambia and its communities has been overwhelmingly positive," he told VOA. "It has brought jobs, growth, education and infrastructure development. Where there is wrongdoings, breaches of regulation or abuse of the Zambian people and unsafe mining methods, this government will actively and immediately intervene to ensure that the lives of our people are guaranteed." So where does that wide disconnect come from? Lange blames the gap between the government's strong words and its ability to enforce them, and added that mining companies often implement changes in the surrounding areas without consulting the community. He said one of the main messages from activists at this year's mining gathering is that mining giants need to collaborate more with communities.